4) Power It is imperative that you first train for flexibility, then stability, followed by strength and finally power. To ignore the order of this cycle is to invite erratic performance and eventually injury. In this short article, I’d like to focus on # 3 and # 4, clarify the difference between strength and power, and provide you with a sample exercise from each category. So what is the difference between strength and power? In other words, strength is more about how much load you can move – the load can be a dumbbell, cable machine, resistance band, even your mother-in-law (provided she consents, of course). Golf does not require us to move heavy objects; therefore the majority of your power training will be focused on “learning to move fast”, while the strength training exercises are performed at a moderate speed. 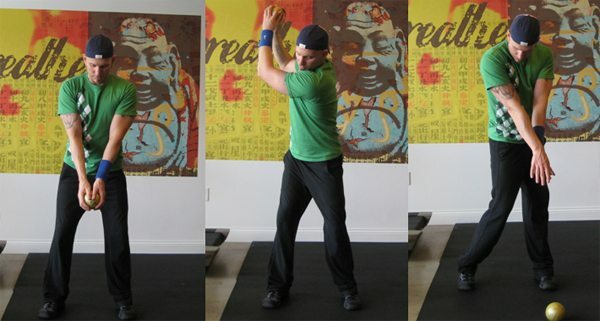 As an example, let’s look at two similar golf-specific rotational exercises, with one being for strength and the other for power. 1. Set the anchor point of the band slightly higher than shoulder level. 2. Stand with a wide and stable stance and grab the band first with the hand on the side you are rotating to – the other hand should go on top of that hand. 3. Take a belly breath and draw your navel inward to set the deep abdominal wall. 4. Monitor your head and spinal position – keep them in neutral throughout this exercise. 5. Exhale as you rotate your torso on the solid and virtually immobile foundation of your legs and pelvis. Keep the path of your hands and the cable in a diagonal line. The speed for both directions should be 2 seconds i.e. 2 seconds chopping the band across your body, and 2 seconds returning it to the top starting position. 6. Complete 8-12 reps on that side, then switch to the other side. 1. Use a 1-2 lbs. medicine ball. Either one that doesn’t bounce (a dead ball) or ensure that you are in a safe area with a partner or wall to stop the ball. 2. Start at your address position. 4. Perform a ¾ backswing motion, and then immediately swing down toward the floor with full speed, releasing the ball into the ground. 5. Perform 6 reps on the same side, rest briefly, and then perform 6 reps on your other side. As you can see, these are both essentially the same movements, but with the Wood Chop being performed with a controlled strength phase speed (2 seconds down/2 seconds up), and the Power Swing performed as fast as possible on the downward movement. Integrating strength and power training phases into your workout routines will pay big dividends off the tee and with all of your medium/long clubs. 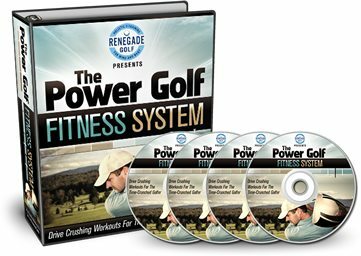 This System consists of a detailed manual and videos taking you through all four phases of The Power Golf Fitness System, just like the tour pros (but modified to fit into the schedules of people with “real lives” and commitments). That means that you’ll be able to follow along and perform these workouts at home (or in a gym) in a time-efficient and safe manner… and get all the results you want, both on and off the course. To find out more simply click here. I feel intimidated when I play with golfers that are better than myself, what should I do to get over this? To get over this intimidation you should search out the better players and play with them and you’ll soon find that they’re just normal human beings. It’s just that they’re better at a particular skill than you are. But hey that’s life, you’ll be better than them at something else. So don’t worry and instead you should aim to learn from these better players and most of them are willing to help where they can. The quickest way to success in any area of golf and life is to find people better than ourselves and then model what they do. When you are playing with a better golfer than yourself, watch what they do, observe how they approach shots and pick out the bits and pieces you want to emulate and then practice that. Obviously there will be things that golfers do that you won’t want to copy, but try to pick out things that will suit you and practice it. Also, as an aside, it’s been proven that the golfers you play with most often will be of a similar playing ability to yourself. So if you want to improve your game it makes sense to search out better players and play with them. You know, those we are around most often we become like… so make sure they’re good sorts too. That was an answer to a golfing question I have received from one of my students in the online Consistent Golf School. If you would like me to give you a solution to a golfing problem you’re having, simply go here, signup and I’ll do that for free, anytime as part of being a student of the online Consistent Golf School. Ok, that’s the end of this week’s issue of the Consistent Golf Gazette. I hope you enjoyed it. Look out for the next issue next Sunday.